In Greek mythology, the Amazons were a race of warlike women noted for their courage and pride who lived at the outer limits of the known world, sometimes specifically mentioned as the city of Themiskyra on the Black Sea. Their queen was Hippolyta and although Homer tells us they were ‘the equal of men’, they fought and lost separate battles against three Greek heroes:Hercules, Theseus and Bellerophon. Scenes from these battles were popular in Greek art, especially on pottery and in monumental sculpture adorning some of the most important buildings in the Greek world. In mythology, the Amazons were daughters of Ares, the god of war. They were a women-only society where men were welcomed only for breeding purposes and all male infants were killed. In legend, the Amazons burnt off their right breast in order to better use a bow and throw a spear, indeed, the word amazon may signify ‘breastless’. Interestingly though, Amazons are not depicted in Greek art with a missing breast. They are most often depicted wearing hoplite armour and frequently ride a horse. The most common weapon is the bow and spear but there are also examples where Amazons carry axes. The first meeting between Greeks and Amazons was when Hercules was sent by Eurystheus, the king ofMycenae, Tiryns and Argos on one of his celebrated twelve labours, this time to fetch the girdle of the Amazon queen Hippolyta. The girdle was given by her father Ares and the task was set by Eurystheus precisely because it was an impossibly dangerous endeavour. In some versions of the story Hercules goes alone but in other accounts he first assembles an army led by the finest Greek warriors, including Theseus. In some versions, the taking of the girdle turned out to be rather easier than expected when Hippolyta willingly handed it over but in other versions, Hera - always against Hercules because he was the fruit of her husband’s illicit affair with Alkmene - stirred up the Amazons to give the Greek hero and his army a hot reception. Fine fighters though the Amazons were, they were no match for the invincible Hercules who took the girdle back to Eurystheus. Intriguingly, our earliest depictions of the story in pottery predate the literary sources for the tale by two centuries and they sometimes show Hercules fighting an Amazon named Andromache or Andromeda and in none is a belt ever depicted. This is, once again, evidence that the oral myths were more complicated and varied than the literary versions that have survived. A more definite plot element is that during this expedition Theseus fell in love with and abducted (or eloped with) the Amazon Antiope, an action which would lead to a second encounter between Greeks and Amazons. Hercules fighting Amazons was represented in sculpture on the frieze of the Treasury of the Athenians atDelphi (490 BCE), on the Temple of Apollo at Bassae, on the Hephaisteion of Athens (449 BCE) and on metopes on the Temple of Zeus at Olympia (470-456 BCE). The throne of the cult statue of Zeus, one of the Seven Wonders of the ancient world, was also decorated with scenes from this famous myth. Theseus eventually became the ruler of Athens but the Amazons had not forgotten the loss of one of their members and so launched an expedition to rescue Antiope. Theseus defeated the barbarian invaders but during the battle, Antiope was killed. Theseus abducting Antiope is the subject of the pediment from the Temple of Apollo at Eretria (c. 510 BCE) and on the metopes of The Treasury of the Athenians at Delphi. Bellerophon was involved in a third meeting between Greeks and Amazons. He was another hero who had to perform impossible tasks in service to a king. This time Proitos, king of Argos, outraged at (false) accusations from his wife that Bellerophon had attacked her, the king sent the hero to serve Iobates. It was he who set the hero the task of killing the Chimera - a fantastic creature which was a fire-breathing mix of lion, snake and goat - and when Bellerophon managed that feat he was told to go off and fight the Amazons. Naturally, the Greek hero won the day and was even made heir to Iobates’ kingdom in Lycia on his victorious return. A fourth and final meeting with Amazons came towards the end of the Trojan War. In the Epic Cycle we are told that the Amazon Penthesilea aided the Trojans but was killed in battle by Achilles. In some accounts Achilles fell in love with his victim when he removed her helmet and the scene is captured on a celebrated black-figure vase by Exekias (c. 540 BCE). More general Amazonomachies (battles with Amazons) were present on the shield of the cult statue ofAthena Parthenos in the Parthenon (438 BCE), on the west pediment of the Temple of Asklepios atEpidaurus (395-375 BCE), on the Temple of Athena Nike on the Athenian Acropolis (c. 425-420 BCE), on the Tholos of Delphi (380-370 BCE) and on the Temple of Ares in the Athens agora. The oldest depiction of a warrior fighting an Amazon is on a terracotta votive shield from 700 BCE. Hercules fighting Amazons is the hero’s second most popular labour depicted on Greek black-figure pottery (after the Nemean lion) with almost 400 surviving examples. Amazons fighting unnamed warriors were common throughout the 6th and 5th centuries both on black and red-figure pottery. In particular, during the 5th century BCE in Athens, these mythological battles with Amazons came to represent contemporary events, i.e. the battles between Greeks and the invading Persian Armies of Darius at Marathon (490 BCE), Xerxes at Salamis and the Persian attack on Athens itself in 480 BCE. In this sense, Amazons came to represent barbarous foreigners; indeed depictions of Amazons on pottery in this period are shown actually dressed in Persian costume. 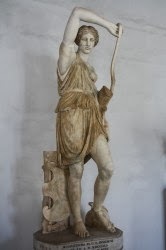 Public buildings and their accompanying sculpture were, without doubt, an important method of mass communication and depictions of heroes fighting Amazons reminded ordinary people that the political leaders had successfully defended Greek culture against the threat of foreign, and in Greek eyes less civilized, invaders.